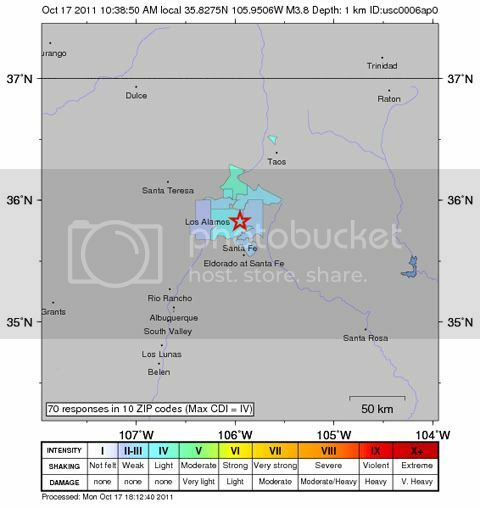 "At 10:38 a.m. this morning, a magnitude 3.8 earthquake shook Nambe..."
At 10:38 a.m. this morning, a magnitude 3.8 earthquake shook Nambe, approximately 9 miles north of Santa Fe, according to reports by the U.S. Geological Survey. Other cities exposed to the quake included Santa Fe, Pojoaque, Espanola and Los Alamos, according to the U.S. Geological Survey website. The earthquake shaking alert level was rated as “green,” which indicates a low likelihood of causalities and damage. On Facebook, people in the area reported that the earthquake felt like a large truck passing by their house, or like quakes in Southern California, where they used to live. More information on the USGS website. Click here to view a community intensity map. The Santa Fe New Mexican is running a Storify article on the event, which you can view below.